The performance Great Sacrifice is a live work from the project Ingredients needed for a Great Sacrifice. 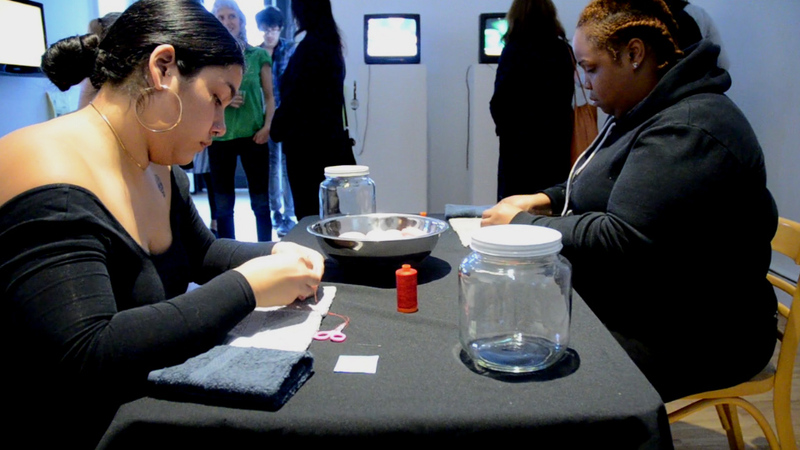 The performance involves embroidering goat testicles which will later be pickled in jars and showcased during the exhibition. The Great Sacrifice performance deals with concerns of violence, sexuality, and gender roles embedded within domestic acts of preparing and consuming food. The dish of goat testicles is both a delicacy and a controversy in Pakistani cuisine. Hurmat Ul Ain is an interdisciplinary artist and art educator. Her work is performative in nature, and employs lens- and time-based mediums. The subject of her work deals with concerns of relations between body, gender, food, hospitality, and service. She holds a BFA from National College of Arts in Painting (2006) and a MFA in Performance Art from the School of Art Institute Chicago (2011) where she was studying as a Fulbright Scholar. Ain is a pioneering member of an art collective based out of Islamabad. Much of her practice is both collaborative and socially engaged. She has been teaching, building curricula, and curating structures for academic archiving at School of Art, Design and Architecture (NUST) in Islamabad since 2011. Her work has been shown in the U.S, U.K, India, China, Dubai, Japan, Germany, and Pakistan.